This Chocolate and Hazelnut Mousse can be whipped up in a flash and is completely delicious and utterly moreish. 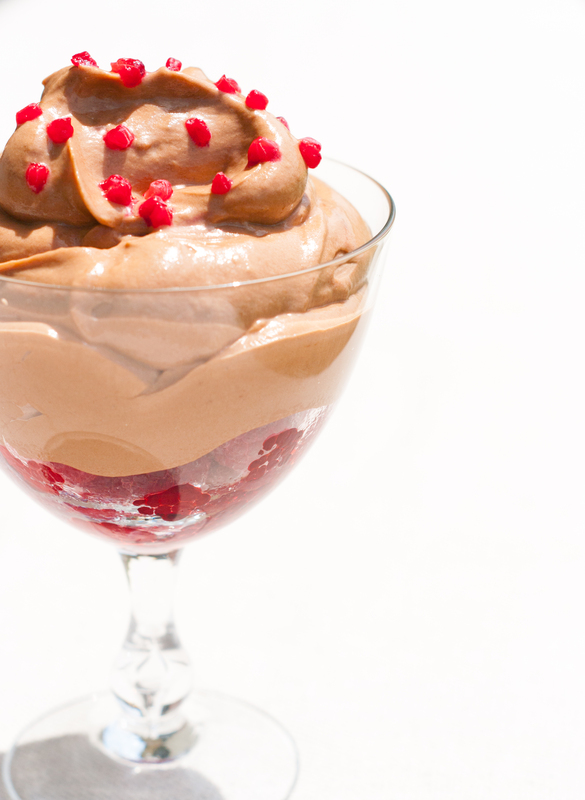 The sour of the raspberries is complimented by the creamy mousse. Topped with Raspberry Caviar it’s the perfect Valentine’s Day treat for your someone sweet. Scatter McCain Season’s Choice Raspberries, over the base of 4 small-sized serving glasses and set aside. Separate the raspberry drupelets from the main fruit, place on a freezer-proof plate and place in the freezer until needed. Place chocolate in a heatproof microwave-safe bowl. Microwave on medium (50%) for 2 to 3 minutes, stirring with a metal spoon halfway through cooking, or until smooth. Set aside for 10 minutes to cool. Beat cream in a bowl to soft peaks and then fold through the melted chocolate and hazelnut spread. Spoon the mousse among serving glasses over the raspberries, scatter with raspberry drupelets to resemble caviar and serve immediately. Awe thank you Sadia! It was so yummy!